Typical green freight wagon of the Dutch Waste Disposal Company (Vuil Afvoer Maatschappij or VAM in short). The wagon consists of two containers that can be tilted. The doors can be opened to dump the “waste” when the containers are in the tilted position. 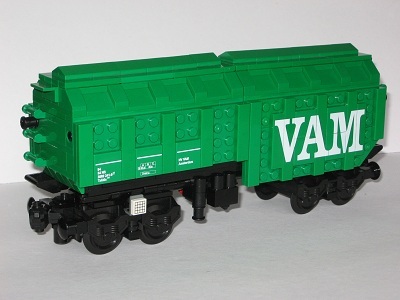 When one containers is tilted, the second one is tilted to the other side at the same time to prevent the wagon from falling over just like the real VAM-wagon! The roofs of the containers can be taken off for filling them with “waste”. The set comes with very detailed stickers. All parts are brand new. The Dutch Waste Disposal Company (VAM) was founded in 1929. The original goal was to transport the household waste of the densly populated cities in the western part of the Netherlands to area's with poor soil in the eastern part and to present it to compost. The compost could then be used for soil improvement and reclamation projects. Today the VAM is a Attero company, formerly known as Essent Environment. The VAM operated two types of wagons. The first type had four doors (2 on each side) to dump the waste. 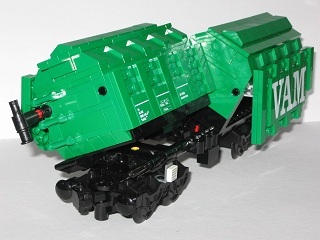 The second (Brick Express) model was designed with two seperate containers that could be tilted. In total 165 wagons were built. They could transport 40 tons of waste each and had a useful volume of 100 m3. Most of these wagons drove a dubble trip dayly between the cities and the dumping-ground at Wijster for about 250 days a year.